Menai Central is on the corner of Menai and Carter roads. 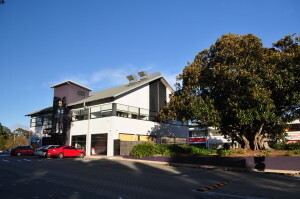 Building G (also called Century 21 House) is next to the beautiful big tree at Menai Central Shopping Centre. We are above the F45 gym. You can either take the stairs or the lift to level one. Disabled Access: Please use lift. Disabled parking space outside front of building. Parking: There is plenty of easy parking at Menai Central both at building G and in the underground car park. There is also street parking on Carter Rd. Public Transport: There are easy bus routes that link Menai with Bankstown, Padstow and Sutherland railway stations. See the map above for the bus stops around Menai Central. Bus M92 brings your to Menai from either Bankstown or Padstow stations.